For the first time in recorded history, three Category 4 hurricanes have appeared in the Pacific Ocean at the same time, and they’re inching ever-closer to the Big Island of Hawaii. The never-before-seen meteorological event involves the hurricanes Kilo, Ignacio, and Jimena, the latter of which has sustained winds of up to 225 km/h. According to the US Weather Channel, we haven’t seen anything close to this event before – three simultaneous Category 3 hurricanes have yet to be recorded. While the most immediate threat is to the coast of Hawaii, Japan, the Philippines, and Taiwan are also currently on watch. Right now, Ignacio poses the biggest threat to Hawaii; at midnight last Sunday, it was about 450 km to the southeast of the Big Island and is expected to travel north of the Hawaiian islands on Tuesday and Wednesday. The hurricane, which has contained winds of up to 217 km/h, is unlikely to actually hit the coast, but experts are saying residents should expect heavy rain and winds of up to 63km/h as early as tonight, and a 6-metre swell and rip currents in the water before the storm settles back down later in the week. Needless to say – don’t go in the water. After Ignacio sweeps past the north of Hawaii, it’s not yet clear in which direction it will head next. Hurricane Jimena, on the other hand, is expected to sustain its ‘major hurricane’ status till at least the midweek, but so far, it poses no threat to any island just yet. But that’s only because forecasters aren’t really sure where its path will take it at this stage. 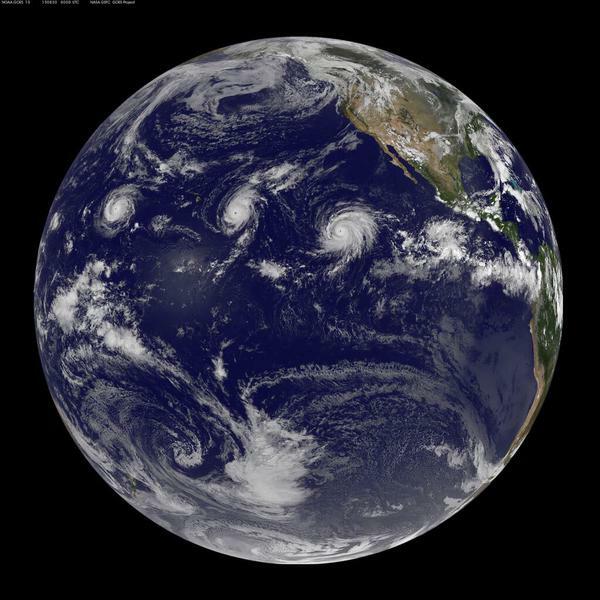 Kilo is the least threatening of the three, safely churning up the open waters of the Pacific with its 220 km/h winds. The event has been linked to a stronger than usual El Niño event, which researchers are saying we should start to get used to, as many more are expected in the future.